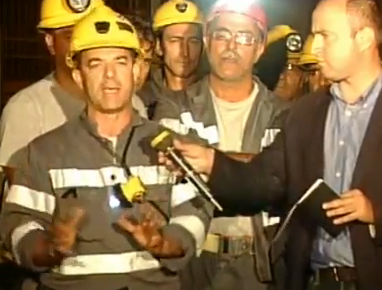 49-year old Sardinian miner Stefano Meletti slashed his wrists in front of television cameras on Wednesday to protest the planned closure of Italy's last coal pit. Reuters reports that Meletti was one of around a hundred miners who have locked themselves underground with explosives since Sunday in an effort to keep the coal pit operating. Meletti, a 24-year veteran of the mine, slashed at his arm twice at an impromptu underground press conference after declaring that "if someone here has decided to kill miner's families, ladies and gentlemen, we'll cut ourselves" and retrieving a knife from his back pocket. Two of Meletti's fellow miners then grabbed his arms and tackled him to the ground. The Carbosulcis mine in Sardinia employs 500 people and provides coal to a nearby state-run power plant. According to miners state-owned energy giant Enel does not purchase sufficient coal for the mine to continue operating amidst Italy's current economic doldrums. Miners hope to convince the government to convert the mine into a joint mining and carbon-capture project in order to ensure its future viability. Undersecretary of Economic Development Claudio De Vincenti has overturned such hopes, however, stating that the carbon-capture project would is economically unfeasible and at "almost 200,000 euros per miner [is] an unsustainable cost."